Galaxy S8+: How do I use the navigation bar settings on my Samsung Galaxy S8+ (SM-G955W)? You can configure the Navigation bar background color and button layout. 4. Navigate to and touch Navigation bar. 5. Select the desired BACKGROUND COLOR. 6. 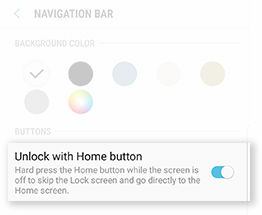 To turn on the Unlock with Home button feature, touch the slider. 8. To adjust the Home button sensitivity, drag the slider. 9. 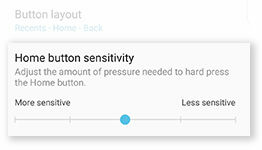 Adjusted settings are automatically saved.